When Tony Sigel first examined the bust of William Pitt for our Philosophy Chamber exhibition, he knew something wasn’t right. The life-sized figure by Joseph Wilton was covered in thick, discolored white paint, which was lifting and flaking in some spots. It had been catalogued in Harvard’s Portrait Collection as a cast plaster sculpture, but instead showed signs of a different material. Examining the back of the bust with a flashlight, Sigel, senior conservator of objects and sculpture in the museums' Straus Center for Conservation and Technical Studies, could discern obvious marks from a wire-loop tool, commonly used with clay sculpture. Cast plaster would have been poured, not modeled, and typically sets too quickly to use such a tool. When Sigel gently tapped the bust, he was surprised to hear a high-pitched, ringing tone—plaster would have registered a dull sound. 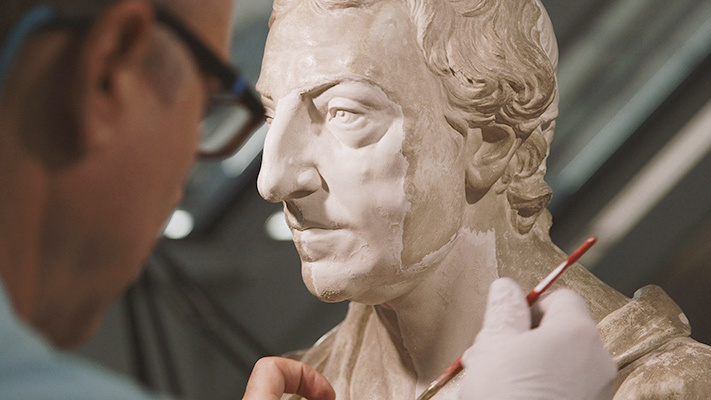 As the conservator assigned to assess objects for the exhibition The Philosophy Chamber: Art and Science in Harvard’s Teaching Cabinet, 1766–1820, Sigel realized that this sculpture needed more than a routine cleaning. With the support of exhibition organizer Ethan Lasser, who is head of the Division of European and American Art and the Theodore E. Stebbins Jr. Curator of American Art, Sigel and his colleagues in the Straus Center’s analytical lab embarked on an investigation into the bust’s very creation. Their detective work would help inform the treatment and ultimately enhance our knowledge of the 18th-century object. Even without the mystery of its creation, the bust of Pitt has an interesting history. None other than Benjamin Franklin gave the sculpture to Harvard College in 1769. (A letter from the Harvard Corporation thanks Franklin “for his very acceptable present of a fine bust of that great assertor of American liberties, Lord Chatham.”) The first portrait sculpture to enter the college’s collection, the bust was displayed in the Philosophy Chamber—a grand space on campus that was equal parts laboratory, picture gallery, and lecture hall—but little else is known about the bust’s early history at Harvard. P17 Joseph Wilton’s William Pitt, Earl of Chatham (1766–69) was given to Harvard College in 1769 by Benjamin Franklin. 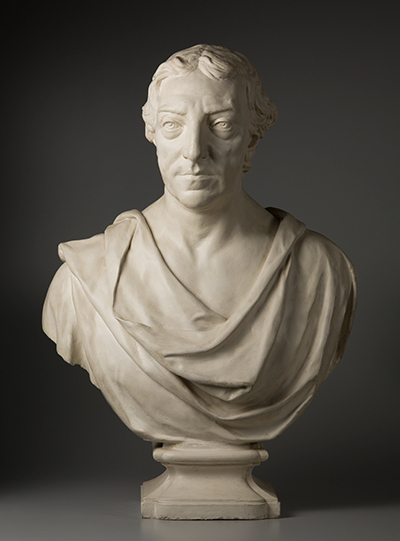 Joseph Wilton, the bust’s maker, was an established artist who crafted works for and advised wealthy English patrons. Ultimately, he created two full-length figures of Pitt and up to seven portrait busts, most in marble. Once the bust came to the Straus Center, Katherine Eremin, the Patricia Cornwell Senior Conservation Scientist, and Claire Grech, then a fellow in the analytical lab, got to work with Sigel in figuring out the composition of the bust’s paint layers, which would help confirm its age and original appearance. 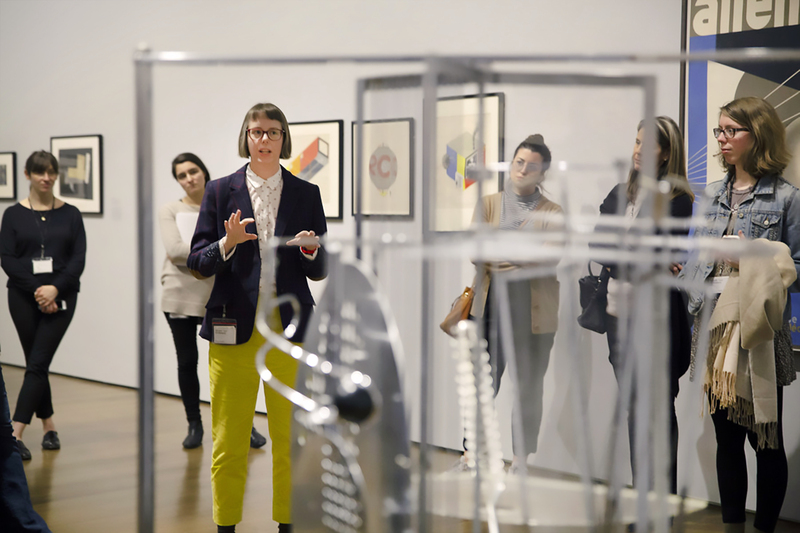 By extracting a tiny sample from the work and magnifying it to 100 times its actual size, the team was able to clearly distinguish five layers of white paint on the sculpture. They could also tell that the first layer sat on top of a clean clay surface, indicating that it was original, applied soon after the object’s creation in 1766–69. This early date, together with art historical research, suggests that the bust was painted white to look like marble, a common studio practice of the time. 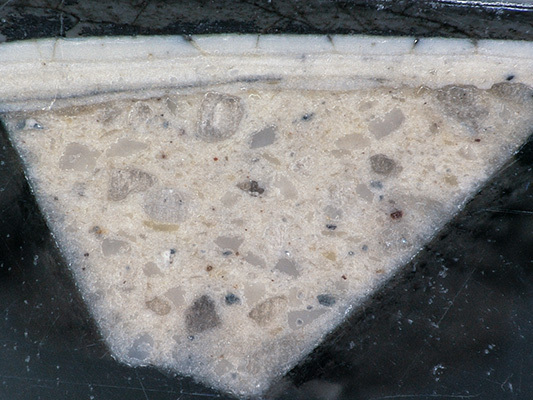 A cross-section sample of the bust, viewed at 100x magnification in visible light, reveals the five layers of white paint over the ceramic as well as the dark line of soiling above the original layer. Materials such as crushed glass and quartz (sand) grains are also evident in the clay. Above the first paint layer was a coating of soot and grime—likely the result of exposure to the coal-heated interiors of early Harvard buildings. It’s possible that past caretakers of the bust simply found it easier to continually repaint it than conduct a cleaning. 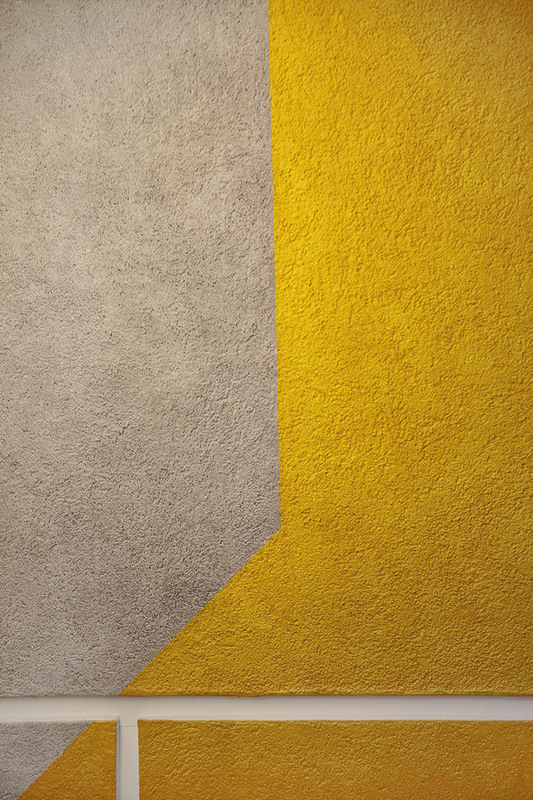 Over the following centuries, at least four more white layers of varying composition were applied (Sigel, Eremin, and Grech describe them in depth in their essay for the exhibition catalogue). While the paint stratigraphy answered some questions about the bust’s outward (and original) appearance, questions remained about how and with what material it was made. Using a borescope (a tiny camera attached to a flexible, snake-like cable), Sigel looked inside the bust’s hollow head. He found a seam between the front and back sections, evidence that it was made in a mold. X-radiographs confirmed this finding. An original terracotta prototype, or modello, wouldn’t have been created this way, but a copy—made from sheets of clay pressed into a two-sided mold and joined together—could have been. An X-radiograph of the side of the bust shows the hollow interior of the head; the dark join lines of the mold-made front and back sections of the head (arrow A); and the air trapped in a layering of clay that was pressed into the mold in the nose, cheeks, and chin (arrow B). He asked a fellow sculpture conservator in England for advice, who quickly suggested an answer: Coade stone. A manufactured ceramic material, Coade stone was widely used for outdoor sculpture and architectural decoration beginning in the mid- to late 18th century. It was popular because it was less expensive and more durable than terracotta. The glass and other additives controlled the shrinkage resulting from firing and made it dimensionally stable. The material is still manufactured in the United Kingdom today. Though the bust’s composition doesn’t fit perfectly with that of Coade stone, it does seem likely to have been a (now obscure) precursor. 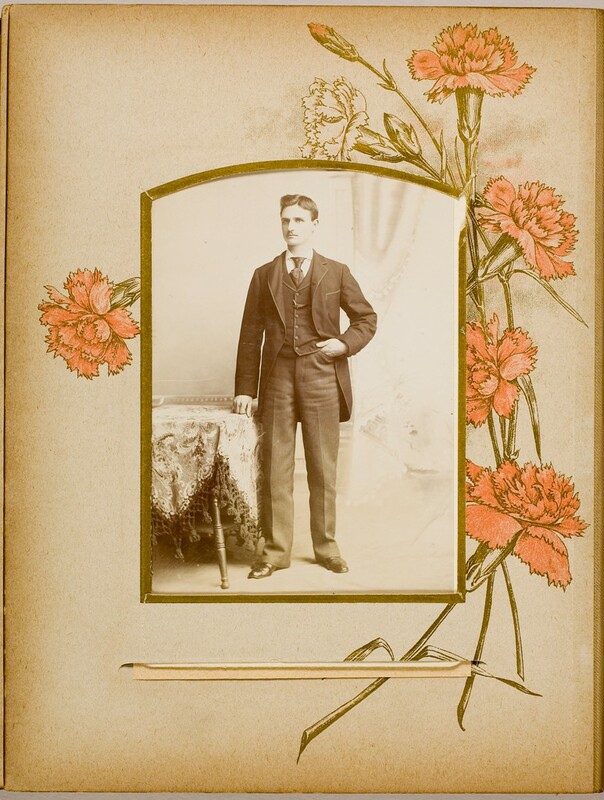 The team noted that Wilton’s father was a successful architectural ornament manufacturer. Furthermore, when the Harvard bust’s dimensions are compared with an identical marble bust of Pitt in the collection of the Fitzwilliam Museum in Cambridge, England, Harvard’s bust is an average of 5 percent smaller. Because Coade stone’s reported shrinkage upon firing is also approximately 5 percent, Sigel posited that Harvard’s bust was probably formed in a mold made from the Fitzwilliam bust. He experimented with a variety of treatment options before finding a safe and efficient method for removing the grime. Eventually, he revealed the bust’s original paint layer (with the exception of two small patches of overpaint and dirt on the back of the bust, which he left in for teaching purposes). of Conservator Tony Sigel performed an extensive cleaning of the bust, which eventually revealed the original layer. of Sigel uses a wood spatula to remove the softened overpaint, revealing the soiled original paint below. of Sigel cleans Joseph Wilton’s William Pitt, Earl of Chatham. Though the entire project stretched over more than a year, it paid dividends. Not only did it result in a cleaning that was probably needed at least 200 years ago, the Straus Center team’s work helped tell a richer story.